49 Degrees North President John Eminger is the kind of person you could picture yourself following around from one fall line to another, swapping wild stories on the lift rides between. In that way he seems like the perfect parallel for the resort, located roughly 10 miles east of the town of Chewelah, that he's owned since the mid '90s. 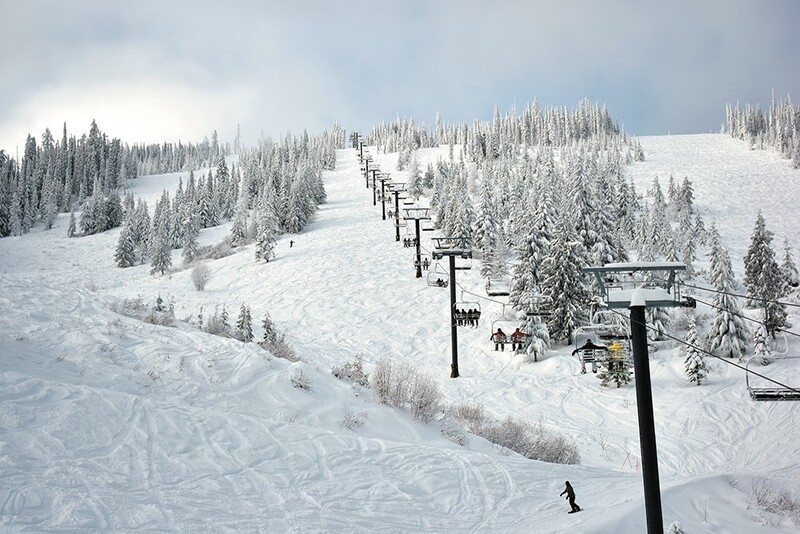 It's an eclectic mix of bowls and glades and winding groomers stretched across 2,325 acres and two stunning peaks. For a self-proclaimed ski bum like Eminger, this is prime habitat. But those thirsting for the steep and deep or that relaxing thrum of corduroy snow aren't the only ones 49 Degrees North caters to. There are 10 miles of cross-country ski trails here, with opportunities for track skiers, skate skiers and ski-jorers alike. And annual events like the Bavarian Race — a downhill event in March that starts, and ends, with a pitcher of beer on the lodge deck — show that even spectators here are in for a good time. What's new: In Eminger's words, "just your standard attention to detail." Mostly sprucing up the lodge and clearing vegetation in the mountain's gladed areas. Chair 4 did get a new cable, Eminger says, extending the life of what he considers one of the more classic lifts in the Pacific Northwest. "It's kind of like staking claim to awesome skiing." Making the most of it: When it comes to skiing, Eminger recognizes that not everyone is riding the lift for the same reason, even after a big storm. If it's powder you're after, he says, head straight for Last Chance or Cy's Glades off Chewelah Peak early in the morning. Either guarantee about 1,200 vertical feet of "perfect pitch." Those who prefer a mellower, longer ride should cruise down Huckleberry Ridge to Bugaboo. Both are groomed early and, following a night of snowfall, offer several inches of powder on top of a layer of fresh corduroy. And if you have any questions about skiing or snowboarding or equipment, Eminger says, "don't be afraid to ask." Lift passes: Adult full day (18-69), $62 Friday-Sunday, $55 Monday and Tuesday; half day, $39. Youth full day (7-17), $49 Friday-Sunday, $44 Monday and Tuesday; half day, $33. Full day for active military, college students and seniors (70-79), $56 Friday-Sunday, $53 Monday and Tuesday; half day, $36. The original print version of this article was headlined "49° North Mountain Resort"